Within 250 miles of Meridian, ID. At this high performance swim clinic, two-time Olympian, gold medalist and University of Missouri coach, Mark Gangloff will be leading THREE SESSIONS – each with a distinct curriculum. There will be two sessions for swimmers ages 12 and older and one session for swimmers ages 11 and younger. Swimmers 12 and over can sign up for one session or both! Scroll down for more details on the curriculum in each session. Take advantage of early bird pricing. Sign up before prices rise! Often called the "long axis strokes", freestyle and backstroke have a lot in common! Both strokes require a long and strong body line, powerful rotation, and an early press back into the water. Olympic gold medalist Mark Gangloff will teach the participants the ways these two strokes are similar in order for them to gain a stronger understanding for the techique for a faster freestyle and backstroke. FREESTYLE: Participants will learn how to hold a straight and solid body line so that they can cut through the water with less drag. Practice keeping a still and low head position (especially during the breath!) while driving a strong flutter kick. Mark will also teach participants how to get an early and powerful press backwards on the water in the arm pull to get more out of every stroke. From the 50 to the mile, your swimmer will learn skills that will allow them to drop time in every freestyle race. BACKSTROKE: Engaging your core not only allows you to swim stronger, but it also allows you to hold the proper body position. Olympic gold medalist Mark Gangloff will help swimmers learn the importance of rotation and how to use it to their advantage for more power in each stroke. The arm pull in backstroke should press the water all the way through using the whole arm to achieve maximum propulsion. Backstrokers are often the fastest kickers on their teams, find out why and learn to have a stronger kick! The short axis strokes are butterfly and breaststroke! These are very similar and challenging strokes to master due to the importance of rhythm and high hips! Participants at this session will learn not only how to have a stronger pull and kick, but also WHEN each movement should happen so that a swimmer's arms and legs aren't fighting each other and they can swim more connected and with more efficiency! BUTTERFLY: Perfect the complexities of balancing power and fluid rhythm in one of the most dynamic athletic movements. Elite butterfliers maintain forward momentum by setting an immediate high catch with a perfectly timed kick. They are committed to a breathing pattern, perfecting their distance per stroke, and maintaining a horizontal body position - Mark will help your swimmer become committed to these same skills to make them their habits every time they swim fly! Mark Gangloff has the knowledge of technique for faster swimming as well as the ability to teach it in a way that can help swimmers of all ages and abilities understand, apply, and improve! He will be in the water with all of the participants to help them learn technique for faster starts and freestyle. Both of these skills require a lot of focus, coordination, and athleticism. STARTS: Set the tone for a great race with a powerful, streamlined and fast start. There are countless intricacies to performing a great start and you only get better with practice. Mark will teach each participant how they should set up on the block and then explode forward for maximum speed and power into a tight streamline. He will also share stories on how he found time to practice and improve his start both in and out of the water for continuous improvement! FREESTYLE: Your swimmer swims freestyle more than any other stroke in training. 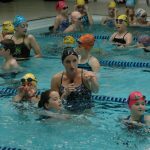 Instead of tuning out their technique, use Olympic gold medalist Mark Gangloff to inspire your swimmer to make each stroke count. Begin by setting up a great bodyline, learning drills to establish high elbows in both your powerful catch and your relaxed recovery and commit to a six beat kick. We know that the breath can slow even some of the most accomplished Olympic freestylers down! Learn to perfect not only the timing but also how to take a low and quicker breath. Swimmers and parents are invited to ask Mark questions during a Q&A session. Gain insight into his training regimen, diet and nutrition, and recovery tactics. 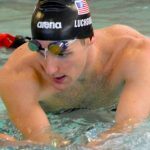 Observe Mark swim at full speed and demonstrate a progression of perfectly executed drills to achieve powerful, efficient and fast swimming. Take a photo while wearing Mark's medals, get autographs, and a gift from TYR Sport!